Claire: I loved this season and the finale, especially. Ryan Murphy outdid himself with season 8; writing an absorbing tale of the never-ending conflict of good vs. evil. My pick for scene of the week is where Constance walks away from Michael after Mallory has run over him multiple times with the Range Rover. As he is lying there dying, he asks his grandmother to take him into the murder house so that he can ‘live forever.’ She considers it for a moment, but then walks away; telling Michael to go to hell! She knew there was no "saving" him, sadly. Jessica Lange is simply superb as the long-suffering mother and grandmother to "the monsters." Klutzy girl: Cordelia sacrifices herself so Mallory can stop Michael. I love that she stood up for herself to the Antichrist and told him that her "sisters are legion". It was amazing. Marko: The fight scenes in this episode were extremely well choreographed and executed. In the vain of all great Marvel-Netflix scenes this one was just up there as well. Justyna: This was such an emotional and powerful hour. The story of the partition of India, told from the perspective of individuals who lost everything as a result. One of the Doctor's companions, Yaz, wanted to travel to the past to find out more about her beloved grandmother, Umbreen. The things she's learned turned out to be so much more painful than she could ever expect. Umbreen's first husband was a good man who died on the day of their wedding, killed by the men working with his own brother to get rid of anyone who "didn't belong" in India anymore. 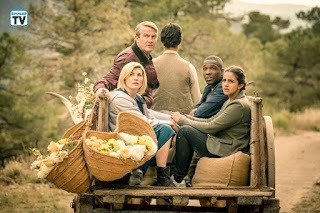 The thing is the Doctor and her friends knew what's going to happen and in order to make sure that Yaz won't be erased from time, they had to step back and do nothing, allowing these events to happen. The moment I decided to highlight in the article is the part where Prem goes to confront his little brother, trying to reach him one last time while the Doctor and her companions watch the conversation from the distance only to walk away once the shot is heard. The look on the Doctor's face when we hear the gunshot was such a quick yet heartbreaking view. Knowing how important each life is for Thirteen makes this tragedy even harder to watch. The pain and hopelessness are also clearly affecting all her friends. It's truly an episode to remember when the Doctor doesn't get to save anyone and can only see the history run its course. Also, the dialogues and the music perfectly match the wonderful actors' performances. Kudos to the cast & crew for this memorable scene. Mads: I've been waiting and hoping for a Fallon/Alexis reunion since last season. Their relationship has become important to me and I want them to work things out, bond, and move forward. This was a nice moment of reconciliation from Alexis to come to apologize and even better when Fallon finally wrote her a check to get Hank off her back once and for all. Marko: Schmitt expresses his feelings. Meg Marinis' written words became a storm of emotions as Jake broke down Schmitt's emotion to the point of heartbreak, along the way they upped his nerdiness as a superhero ability and doing God's work in the progress by saving the most handsome Asian actor I have seen on TV. The interaction between Nico and Levi were all over the place and the way they expressed Levi's sexual awakening felt truly sincere. 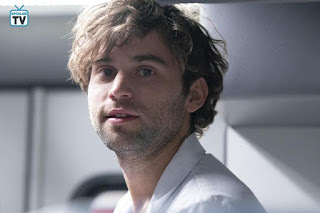 I read some statements from Jake Borelli regarding his own coming out so his performance came that closer to my heart. The next step for the Grey's team is to make these two regulars!!!! We need more of them on screen. Diana: Meredith praises Andrew for the job well done and he starts flirting with her. I think there is a good chemistry between Ellen Pompeo and Giacomo Gianniotti. In spite of what many fans may think, I root for them to be together - they both deserve some fun. Marko: Closing Montage with Oliver singing "All of me". Even though the vows were perfectly written and executed this scene brought me down to tears. Seeing Connor so happy and blessed with the tears in his broken face was a perfect way to end this episode. Justyna: I haven't seen all the episodes of the show but I've been really enjoying this season so far. One of the main reasons why it's been working well for me has to be Constantine's character. He's still such a mystery for the team and the viewers, but during this hour at least one thing became very clear - he would do anything to save a child's life. He's been a great help to the Legends so far, helping them to send the magical creatures to hell but this time he was more focused on bringing back all the children attacked by the monster than fighting the Shtriga himself. When it looks like one of the kids might be too far gone Constantine shares some of his own life force to save the boy. The spell works but Constantine is left seriously injured as a result of this sacrifice. It says so much about his character if he's willing to risk his own life to save everyone else. I feel like we've only started to get to know him but I'm looking forward to seeing more of Constantine's journey on the show. Another great thing about the scene, Ray stands by Constantine's side, following his instructions to allow magic to heal the children. Once the spell is done and he's left all alone with his injured friend and the group of rescued kids, the teenagers he spent the episode teaching show up to help. It was such a lovely surprise, knowing his words truly reached those boys and when it mattered they showed up to save the day. I really liked how each member of the team had their role to play during this episode and Constantine and Ray both found their way to support the kids in the end. Kudos to cast & crew for this great hour. Samantha: Ava talks about never having a childhood due to being a clone & keeping a picture of her 'parents' on her desk to try and feel normal. Jamie: Ava and Sara kiss. Mini-Sara and mini-Ava were all kinds of adorable this week and the kiss mid-transformation was just the cherry on top. Claire: The ending scene where Corky is feeling as if all of her optimism is for naught. Corky is crestfallen when she finds out that a long-time friend actually did try to murder his wife. She had been convinced that he was innocent. He wasn’t. Murphy reaches out to her, convincing her that the world needs more people like Corky and fewer pessimists like Murphy. This was very reminiscent of the original Murphy Brown’s Corky/Murphy dynamic. It is difficult for Murphy to reach out to people and to be a comfort, but it is this uncomfortableness that makes the scene and this relationship work so well. Also, seeing Corky get drunk on two shots of vodka before noon at Phil’s is too funny! Luana: Georgia takes care of Max. 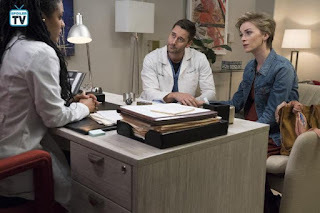 These two are so sweet, and though I loved the scene at the beginning where Ryan Eggold was shining with his charm, this scene where he's so vulnerable and he confesses his doubts to his wife was heartbreaking, plus her reassuring words echoing his earlier words about his patients showed some great writing there. He was taking care of everyone else all day and now it's time for someone else to take care of him. DJRiter: Georgia and Helen team up to make Max start treatment - At first I wasn’t fond of Georgia's character. The way she has stepped up first defending and now taking care of her husband, she is quickly becoming one of my favorite characters of this amazing show. This was a wonderful scene where she and Helen tag teamed Max about starting his cancer treatments. 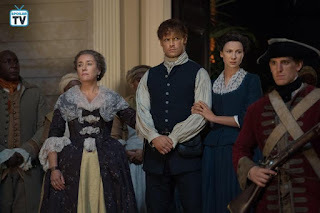 Laura B: So far this season has been somewhat less nuanced than previous seasons where two episodes in Jamie and Claire continue to brutally experience violence of the new world. Trying to help Rufus, a slave survive a counter attack against the slave overseer at Riverrun, only proves to be no-win situation. As if it wasn't bad enough Claire saved him through surgery after being strung up with a large hook embedded in his gut, but when she realizes that by doing so she risks the lives of many other people, including other slaves, she turns around and poisons Rufus with lovely talk of his sister over tea, only for his dead body to be taken, dragged through the yard, and strung up anyway. The only thing they can hope for is that they saved his soul and gave him a more peaceful death, but for me, even that still feels so wanting. It was an overall strong unsettling episode that accumulated to this scene with deep sense of nausea and loss of justice. Something hard to see, but important to remember. Claire: This week’s episodes were much weaker than the previous week’s. But episode 3 of season 2 of this hit or miss anthology series had the benefit of guest star Michael Shannon. He just makes everything he performs in that much better. In this episode he plays a Russian businessman meeting with his international internet date, portrayed by Judy Greer. Trying to impress her, he puts on a mini show with his ‘comrades.’ And to see Michael Shannon doing a dance and rap performance in a thick Russian accent; well, what is there NOT to love? It was brilliant! DJRiter: Alex’s reaction after Col. Haley reveals her true colors – If there’s one other character than Supergirl that has shown tremendous growth over four seasons it’s Alex Danvers. There’s no better illustration of this than her reaction to Colonel Haley showing her true colors revealing disdain for aliens at the DEO, in particular J’onn J’onzz. Season one Alex might have reacted badly and decked the Colonel, but this more mature and in charge Alex reacts perfectly, carefully choosing her words to defend J’onn as her mentor, former director and family. Then she wisely acquiesces to Haley’s unlawful command to salute her, knowing if she’d disobeyed, she’d have been replaced. She used her wisdom, calm and maturity as a leader that J’onn has taught her to carefully pick her battle with this threat to the main mission of the DEO. 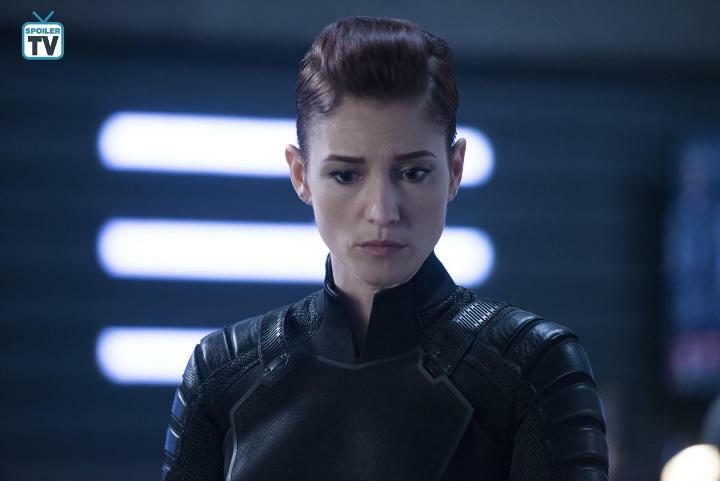 Chyler Leigh kept Alex calm, collected and in control, but you could see the anger lurking behind her eyes, and the brain quickly processing how to react. Mads: This scene was so well choreographed and gripping. I couldn't look away. It just goes to show the lengths Hannah is willing to go to in order to protect this money because she could have gotten him to go in the other room and escaped out the door, instead she fought with him deliberately to keep him away from the money specifically. Then she winds up murdering him. The Perez family is starting to have a lot of bodies to keep tabs on. Justyna: When I went back to choose the best scene of the episode I realized just how many moments would be worthy to highlight from this great hour. There was Nora learning her mother's story and the two finally bonding, Caitlin and Cisco's heart-to-heart, as well as Ralph's rescue and comic book trick, and pretty much every scene that showed the breathtaking (and truly scary) abilities of Rag Doll. 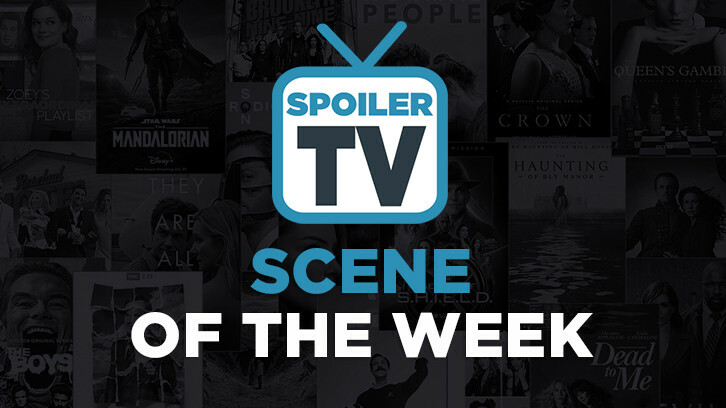 As much as I would want to take a minute to appreciate all those scenes and more, I had no doubt which moment absolutely had to be included as Scene of the Week. Iris jumping off the roof to unlock Barry's cuffs and allow him to save them both was a true act of heroism and love. It was a completely crazy idea which could have ended in a terrible tragedy but the fact that Iris reacted in this way, without any hesitation shows just what an incredibly brave character she is. It also displays just how much faith and trust Barry and Iris have in each other, making them such a powerful and fantastic couple. I loved the impression that Iris has made on the other characters and the viewers. The effects of this scene were impossible to miss on the social media and I'm so glad to see Mrs. West-Allen at the center of this comic book rescue. It's also exactly the thing that Nora needed to see to finally understand her mother, to see who she truly is and reach out to her after all this time. Great scene and the episode overall. Kudos to entire cast & crew for this memorable hour! 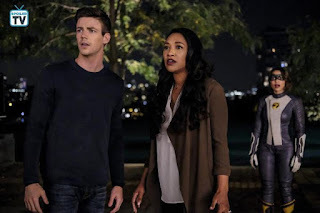 Naomi: After Rag Doll pushes Barry off of a roof (tied to a chair and in power dampening hand cuffs of course), Iris dives head first off of said roof to unlock Barry's cuffs. Once free, his powers ignite, and he wooshes them to safety. He gives her that wide-eyed look and gratefully kisses his brave wife. What an awesome scene! It was a pure comic book rush and also fully captured the depth of the West-Allen love story all at once. Beth: Iris dives off the building to save Barry. That scene was the epitome of what WestAllen is to each other and how they are totally in sync. Iris had no hesitation and had 100% trust that Barry would return the favor and save her once free. It also showed Nora that her mother IS fearless and her devotion to Barry runs very deep. DJRiter: After getting knocked out after vibing to help Caitlin find her father, Cisco wakes up in the med bay with a concerned Caitlin sitting with him. What transpires next is a heartfelt scene between the two as a testament to their friendship. 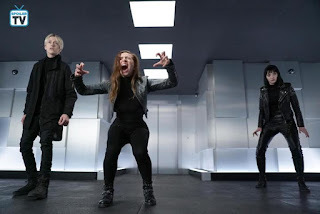 Danielle Panabaker and Carlos Valdes have always made Caitlin and Cisco strong supporting characters, but the sincerity and emotion they poured into this warm scene is perhaps their strongest and finest moment of the series. So touching and beautifully performed. Mads: I had to choose this scene because it genuinely shocked me. My jaw actually dropped. I suspected Rebecca would murder someone, that much was fairly obvious but I honestly did not expect her to brutally murder every single person in the bank. It was horrific, especially knowing what her powers are. The look on Reeva's face in particular was devastating. Rebecca's actions will have ramifications and consequences that will effect mutants all over the world. Reeva is a hard woman, but this was never what she wanted. I really felt for her and the other members of the Inner Circle in that moment, even in spite of my misgivings of some of their actions this season. Luana: This moment was so small, but so touching, how he said his father never thought he was worth the trouble, but he always knew he was because his brother always looked out for him, even when it made his life harder. Knowing how things turned out just makes it all the more heartbreaking and it made me miss the flashbacks. It's impressive how Steve is one of the best young characters on TV and we've seen so little of him, great job all around. Klutzy girl: It was just an amazing, heroic move. Klutzy girl: Kevin and Zoe admit they're falling in love with each other. I love that he told her he doesn't want to be like his parents and would like to know more about her but he'd gladly be the same way because he was falling in love with her. Zoe opening up to him about the sexual abuse she suffered at the hands of her father was heartbreaking but I'm glad she felt comfortable enough to do so. Jamie: Rebecca sings for Jack. Why do these two make me so emotional? This scene gave me goosebumps. I really love seeing the start of their romance this season.